This new paradigm, what some term the ‘knowledge economy’, has spread into every industry and has quickly become a standard factor in internal product and innovation evaluations. 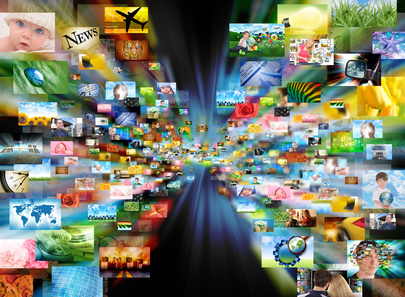 We now have a wealth of information about our consumers that we can use for good . . . or bad. As well, consumers now know far more than they ever have before. For the Osmotic Innovator, it is important to understand how this happened and how it has impacted the way we should go about innovation. In reviewing the impact of the knowledge economy on product development and innovation we don’t need to go to far into the past to find a time when data was not so easily obtained yet product development was undergoing a renaissance. At the turn of the century, after the industrial revolution had changed both the way consumers lived and companies grew, people like Ford and Edison made fortunes inventing new products that have since become iconic. But for every Ford and Edison success there were many failures – like Edisons’ automatic vote-tally system for Congress – or a failed inventor whose radical ideas never were embraced in their time (think about Tesla). The number of failed innovations during this time period was enormous, just as some of the successes (the Model T and the Light bulb) were equally enormous. Without access to data, companies and inventors trusted their gut, valuing passion for a product as the driving force in creating and launching into the market. Moving forward to the 1950’s & 1960’s one enters another golden age in product development in Western economies – the age of marketing. If you’ve ever watched an episode of Mad Men you know the stereotypes: bold marketers using data (and their intuition) to make new products successful by attempting to actually understand and meet new consumer needs. With a market already satiated by 50 years of new products and innovation, companies saw segmentation of markets and use of data to identify the best and safest product launches as one way to obtain a competitive advantage. 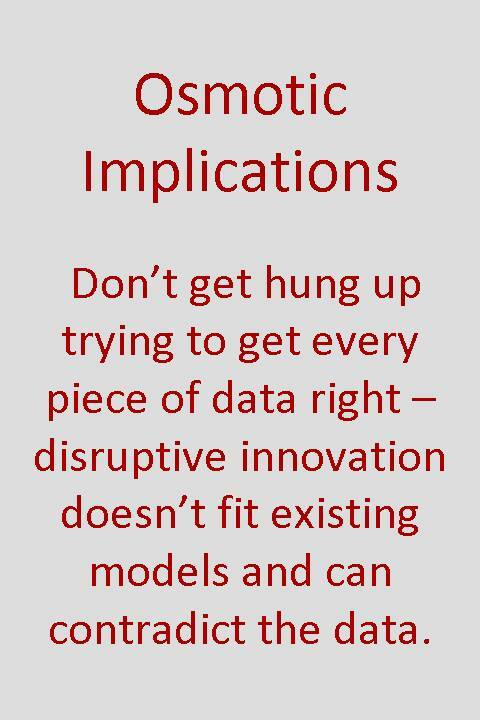 Data was available and used, but it wasn’t the primary driving factor in innovation. Did this increase the number of product successes or the ratio of product success versus failure? We know that product launch success was actually higher in the 1950’s than now, but don’t have the data to understand how this stacks up against earlier periods. Fast forward 50 more years to present day – the era of the ‘knowledge economy’. Vast improvements in computing have allowed equivalent improvements in analysis and theory. No product is launched by a large company without extensive vetting through any number of market research toolkits and analytical systems. Consumers are split into segments and dissected in every way possible as companies in mature and developed industries look for any possible unmet need. Disruptive products that don’t fit the models are scrapped while incremental innovations are launched because they are able to fit into the segments that have been so carefully developed. In many ways, the innovator in a large firm is now crushed by the weight of the data available to them instead of empowered. With all of this data in hand guiding decisions for large firms we must have achieved a new high in new product launch success, right? Actually, current measures show that only 1/3 of NPD launches are ‘successful’ – and the consensus is that this number that has actually decreased since the 1950’s. Obviously, the exponential increases in data and advances in market research tools are not returning an equivalent value in NPD success. 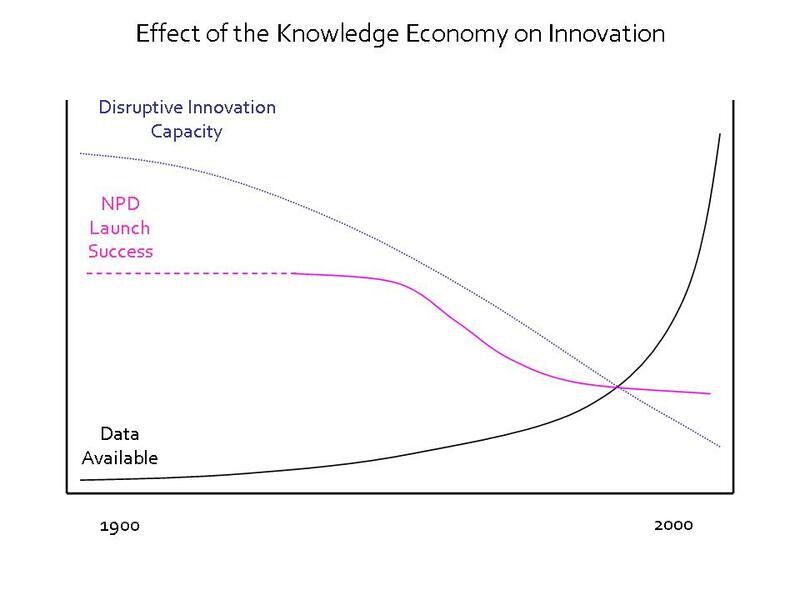 The figure below shows the growth of the ‘knowledge economy’, the corresponding drop in the capacity of a large company to launch disruptive or truly innovative products, and relative product launch success rates. Unless your company is willing to ignore conventional market research and analytical tools – which some might call wilfully ignoring your consumer – delivering true innovation to the market is nearly impossible. That is why disruptive innovation seems to come from smaller companies and start-ups; without a business to protect and with few resources, market research is an unnecessary luxury. Looking at the discussion graphically – the question to ask is why are companies so reliant on data and market research when using it encourages incremental innovation without improving new product launch success? This is the trap of the knowledge economy: it promises to remove risk from new product development yet prevents the innovator from truly exploring disruptive innovation that could create new markets. How can the Osmotic Innovator avoid falling into the trap of the knowledge economy? Are these prescription alone enough to solve the problem of low NPD launch success rates or change the reliance of mature companies on data? No. But they should give the Osmotic Innovator something to consider the next time you are working through the portfolio. This entry was posted in Portfolio management, Strategy, Thinking and tagged incremental innovations, Innovation failure, Management, market research, product development processes.